It looked like an ordinary bunny to Harold. But Harold was a dog by profession, so his judgement wasn't reliable - as he was the first to admit. But Chester, Harold's good friend and house-mate, was a very well-read cat and he knew there was something strange about bunnicula. For one thing, he seemed to have fangs. And the odd markings on his back looked a little like a cape. But when Chester started finding white vegetables, drained dry, with two fang marks in them, he was sure Bunnicula was a vampire bunny. So it was up to Chester - with Harold's help - to alert the members of their household before another carrot was lost. Because as Chester warned, "Today vegetables, tomorrow the world!" 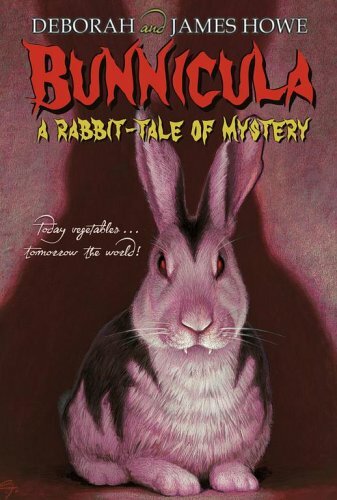 James Howe's classic Bunnicula has remained popular over the years for a reason. Simply put, it's awesome! The first time I read Bunnicula was in my third grade reading class. I fell in love with James Howe's writing then and there. The narration by the family dog (Harold) and the crazy antics of the family cat (Chester) add some much-appreciated humor as the odd couple pair attempts to discover the mystery of the family's latest pet - a rabbit named Bunnicula. This time around, I listened to the audiobook version. It was actually a set with containing the first three books in the Bunnicula series, which also include The Howliday Inn and The Celery Stalks at Midnight. The narrator is the fantastic Victor Garber (also known as Sydney's dad on Alias). "James Howe’s classic tale, Bunnicula, is not a traditional vampire story. Harold, the family dog, tells the tale of a typical suburban family as they adopt a bunny that they found at the movies, only to discover that he is not your typical bunny. This is the perfect book to introduce children to the world of vampires. Bunnicula is a mysterious and sometimes spooky character, but he is in no way threatening to the humans in the story. Chester, the family cat, provides much-needed comic relief. James Howe clearly understands what appeals to children, and the entire series and its spin-offs reflect the timelessness of his writing’s appeal." I love the Bunnicula books! I actually read Bunnicula Meets Edgar Allan Crow for last October's Readathon and it was a perfect fit. Glad to see some love for Chester and Harold and the entire Monroe crew.